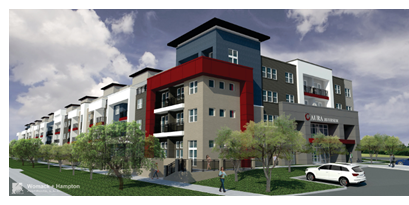 ​​ AUSTIN –​ Another large apartment complex is underway in the exponentially expanding East Riverside drive corridor. This one is located at 6205 E. Riverside Dr. at the southwest corner where it intersects Montopolis Dr. The 368-unit complex, currently named Aura Riverside, is being developed by Trinsic Residential Group, according to the filing with the Texas Department of Licensing and Regulation​. Estimated cost of construction of the complex is $24.5 million. A new leasing center to serve the complex is valued at $425,000. ​The project is expected be completed in June 2019.